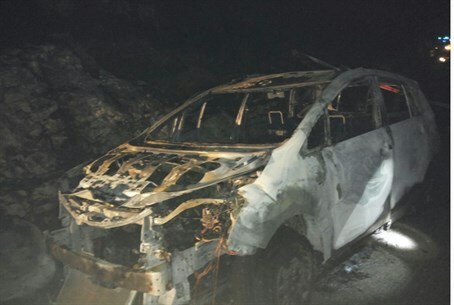 After 11-year-old Ayala Shapira was seriously wounded in a firebomb attack Thursday night in Ma'ale Shomron, Samaria, Otzma Yehudit chairperson Dr. Michael Ben-Ari drove to the scene of the attack from his home in neighboring Karnei Shomron. Ben-Ari revealed that his daughter, just one year younger than Ayala who is in sixth grade, studies at the same school as her. "The shock is great," he noted on Facebook Thursday night. "The murderer aimed the fire at the daughter of every one of us." Speaking in a video shot from his car on the road where the attack occurred, he noted that when it happened Ayala was probably returning from the library or horse-riding in a nearby stable. She was in the car with her father Avner, who was lightly wounded in the attack. Ben-Ari continued saying "therefore there are two partners in this attack," both the terrorists who actually committed it, and the government of Israel which enabled it by freeing terrorists and sending a message that terror pays. Ben-Ari's blaming of the government was echoed by Avner Shapira, Ayala's father, who told IDF Radio on Friday "all of this treating the incident as if it were a criminal event - the idea of treating some young criminals who throw bombs at cars as criminals is a fundamentally flawed concept." According to him, they are trying to solve military problems by legal means, clerical and administrative procedures - not through military operations, as they should. "There is a clear war [here] and we must send the army to chase wanted men instead of just military operations," he added. Ayala was seriously wounded in the firebomb attack Thursday night, and Avner was lightly wounded. Both were taken to Sheba Medical Center in Tel Hashomer, where Ayala's condition reportedly stabilized somewhat overnight. The public is asked to pray for Ayala bat Rut. Two terrorists took part in the terrorist attack Thursday. One of them approached the car to stop it; when the vehicle slowed down, the other terrorist threw a petrol bomb on the car, hitting Ayala in the upper body.